The parallels between the death of Ibragim Todashev and Tamerlan Tsarnaev have raised eyebrows about FBI involvement. As the penalty phase of the trial of convicted Boston Bomber Dzhokhar Tsarnaev winds down, one key question remains unresolved: what exactly was the FBI’s relationship with his older brother Tamerlan before the bombings? WhoWhatWhy has raised the question again and again (see here and here). Tsarnaev’s defense team brought it up in court papers, and even a sitting senator has taken the issue seriously enough to ask the FBI repeatedly about it. The Bureau was forced to admit that it investigated and interacted with the elder Tsarnaev, but steadfastly denies it ever attempted to recruit him as an informant. But did he play some other role? And can we take the FBI at its word? It’s important to note that the term “informant” is a catch-all that may suggest a range of sub rosa relationships not covered in the FBI’s official definition. What’s certain is that the Bureau has a long history of recruiting vulnerable foreign nationals to infiltrate the plots of would-be terrorists. And in a deepening of the mystery of Tsarnaev’s relationship with the feds, it turns out there’s an eerie parallel: the FBI’s little-known, pre-bombing relationship with Tamerlan Tsarnaev’s close friend, Ibragim Todashev. Todashev was shot and killed in his Florida apartment by an FBI agent on May 22, 2013, about a month after his friend Tamerlan was shot and killed during the post-Marathon Bombing manhunt. Todashev was shot while being questioned, supposedly about his and Tamerlan’s alleged involvement in a separate matter: a 2011 drug-related, triple homicide in Waltham, Massachusetts. But some of Todashev’s friends say he believed that FBI agents had another motive entirely for interrogating him: they wanted to find out what if anything he knew about Tamerlan’s earlier interactions with the Bureau. The FBI, other law enforcement agencies, and the mainstream media have told several radically conflicting stories of the Todashev shooting, none of which has ever made much sense. One thing however is clear— whatever information he may have had about Tamerlan’s interactions with the Bureau have been taken with him to the grave. Intriguingly, in the same way the FBI interacted with Tamerlan Tsarnaev long before he became an alleged terrorist and was killed in a gun battle with law enforcement, the FBI had an unexplained interaction with Todashev before killing him. Like Tsarnaev, Todashev appeared in FBI documents long before his death. 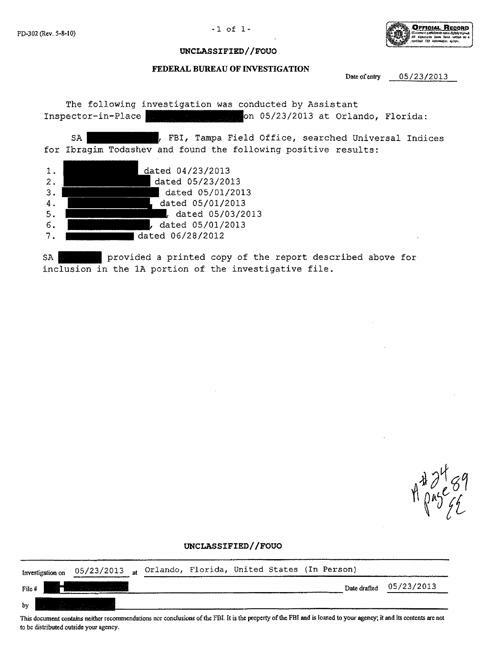 Heavily redacted documents released by the Florida State Attorney’s office reveal Todashev’s name in an FBI database “indices search”—as early as June 28, 2012. These FBI documents were obtained by the Florida State Attorney’s office while investigating the FBI’s shooting death of Todashev. 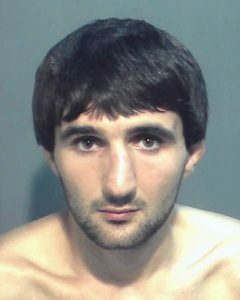 FBI files contain Todashev’s name—long before he became a person of interest regarding the Boston Marathon bombers. Although we don’t know why Todashev’s name appears in 2012 FBI case files, the timing certainly invites scrutiny. The FBI’s interest in Todashev in June 2012 may have had something to with their interest in Tamerlan Tsarnaev, who booked his return flight from Dagestan to the United States six days before Todashev’s name first appears in the FBI files. Both Tsarnaev and Todashev fit the mold of potentially manipulable Muslim foreign nationals. Both were fingered by law enforcement as suspects in a long-unsolved homicide case (although there are good reasons to doubt that either was involved in the savage, almost ritualistic murders of the Waltham drug dealers). And both are now dead. One aspect of the Tamerlan story has always struck observers as odd: the FBI’s apparent lack of interest in him even after the Russian intelligence service pointed him out to the Bureau as a possible terrorist in 2011. And the Bureau’s apparent lack of concern when Tamerlan traveled to the former Soviet Union and began sounding off as a committed jihadist only adds to the parade of oddities. And here’s another: local law enforcement’s bewildering decision not to question Tamerlan about the Waltham triple murders, despite the fact that he was a sparring partner and good friends with one of the victims. Why wouldn’t officials question him? Were they steered away by a government agency that had a vested interest in keeping Tamerlan active in his community? And how might the curious behavior of the FBI vis-à-vis Tamerlan Tsarnaev relate to the Bureau’s investigation involving Ibragim Todashev less than a year later? We know the ostensible reason—a warning from Russian intelligence—that first brought Tamerlan to the feds’ attention prior to the bombing. What about Todashev? Is there any reason to think that Todashev was recruited to be an informant by the FBI? There’s nothing definite in the documents from 2012 to indicate that, says former FBI agent Mike German. It’s possible that Todashev came to the attention of the FBI in 2012 after he applied for a green card; according to his mother-in-law, he received his card in February 2013. However, with everything swirling around these individuals who were known to be associates, it’s hard to believe the FBI wouldn’t take the opportunity to probe Todashev deeper than just a background check for a green card, particularly when one considers the timing of the investigation. Was Todashev the target of this “full investigation”? Not necessarily. 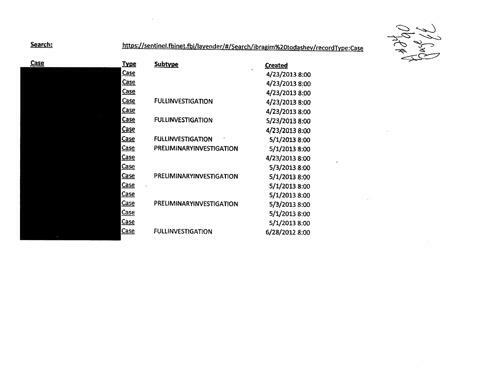 Former agent German explained that in an “indices search,” an individual is listed as either a “reference” or a “subject,” a crucial distinction that is blacked out here. The government claims to have essentially missed Tamerlan’s reentry into the United States despite the fact that he was on multiple watch lists. Yet we know from a 2013 congressional investigation that his purchase of a return ticket caused the system to alert a Customs and Border Protection (CBP) agent in Boston and that this alert was likely shared, at least verbally, with other members of the Boston JTTF [FBI Joint Terrorism Task Force]. In other words, the information that Tamerlan was heading back to the United States after a six-month stay in the violence-plagued Caucasus region probably made it into the hands of the FBI. And according to multiple FBI agents quoted in the unclassified IG IC report, that in itself should have warranted a second look at Tsarnaev. Regardless of the exact nature of the interactions between the FBI and Ibragim Todashev, or the FBI and Tamerlan Tsarnaev for that matter, the FBI has built itself a troubling track record of inciting people to violence—violence that in most cases is stopped short after the FBI swoops in and prevents a “planned” attack, one actually conceived, initiated, and funded largely by the Bureau itself. But what happens when the government fails to stop a terror attack planned by individuals who were at one time recruited as government informants? Is that when a cover-up of any links between the perpetrators and the government begins? Now that’s worth an investigation.